Grocery shopping for a family with special dietary restrictions has gotten easier over the years. I have found that it is safest to stay on the outside of the aisles and stick with mostly fruits and veggies. Once I make my way toward the center of the store it is filled with all kinds of processed foods and very little of them are safe for our little guy. 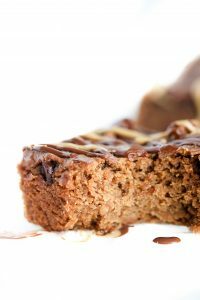 Occasionally you find a specialty item that seems like a life saver but for the most part, it’s a tricky time walking through those areas, especially when it comes to Protein Bars. Back in the day, I never gave much thought to granola bars or protein bars, other than the amount of calories or protein it contained. My older 2 kids, loved having bars on hand for car rides, school trips or just when the munchies took hold of their little bellies. Boy! Did that change after Xander. I have yet to find 1 really safe bar for Xander in a traditional store. It not only has to be Vegan (free from eggs and dairy) but also nut free. A plus if its gluten-free as well. Our specialty store started carrying one that he loves, but it is a little over $2 for a tiny bar. I’ll pay that to keep my child safe, but since we go through bars like crazy, I figured I’d just make them myself. 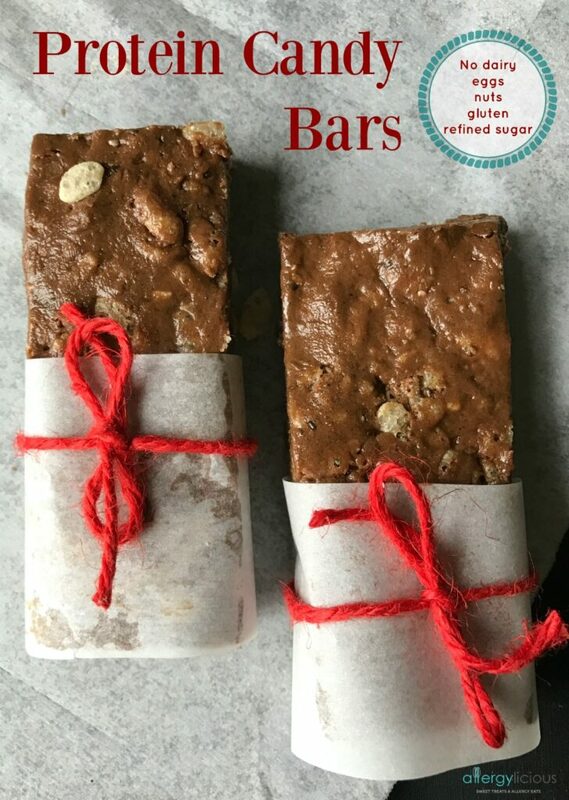 One day, my Spin Instructor brought some homemade bars into the gym. They were so good, that I had to make them. 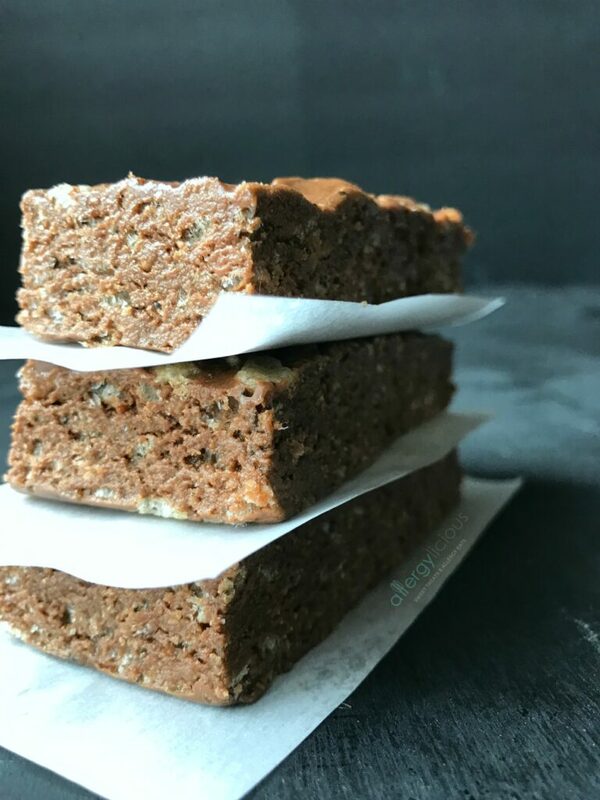 With a little tweaking, I was able to make these delicious bars that I like to call, Protein Candy Bars, because they taste like candy but loaded with protein. 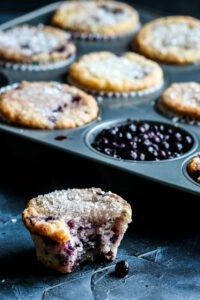 Using 5 simple ingredients, that are Top 8 free, you can easily make a batch of these yourself. No baking required! The ingredients are also completely flexible. SunButter– SunButter comes in a variety of options. Simply pick the one you like the best. I’ve used Crunchy, Organic & Natural and they all turn out wonderful. Sweetener– I first started making these with honey. Then I switched to Brown Rice Syrup. Either one will sweeten it up perfectly but if you use a honey, just make sure to find a local farmer who treats his bees with love! Protein Powder– There are a lot of options out there but I have been using Arbonne for the past year. Its certified non-GMO, Gluten-free, vegan and its also NOT loaded with sugars (other than stevia & fruit). The product itself is nut-free but the facility is not, so keep that in mind. 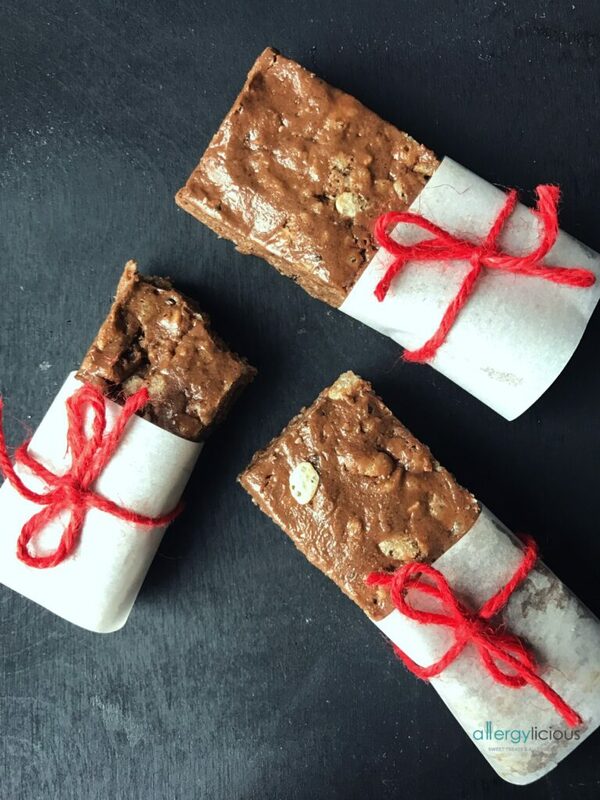 These grab-n-go Protein Candy Bars couldn’t be simpler to make, using only a few allergy-free ingredients. 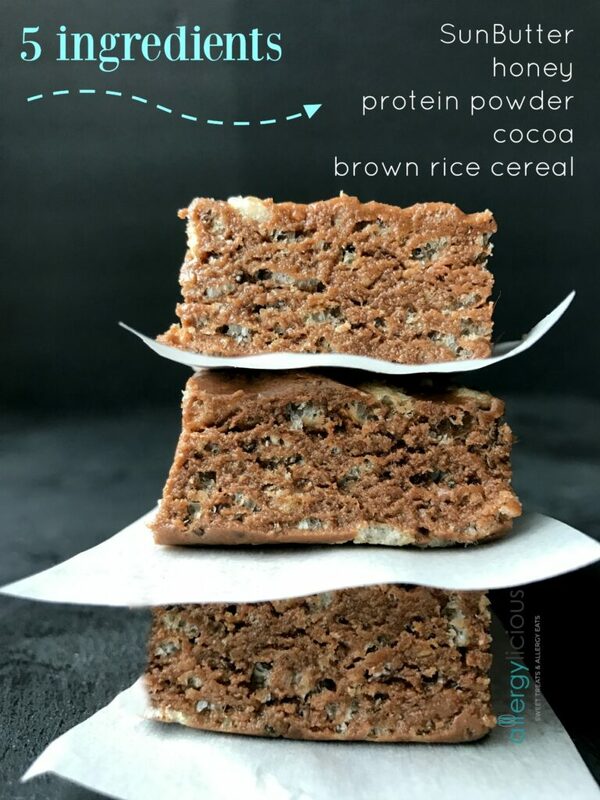 Use as a safe snack for the kids, as a quick breakfast on the go or as a post-workout snack. In a large, microwave safe bowl, combine SunButter & sweetener. Heat for 60-90 seconds, until it stirs easily. Add protein powder & cocoa. Stir to incorporate. Stir in cereal then mix well. Press into lined pan and refrigerate. (I like to lightly spray or oil my hands before pressing into pan so they don’t stick). When firm (45-60 minutes), lift exposed ends of parchment out of pan to remove protein mix. Cut into 24 bars. Sunbutter is made in a Top 8 free, Nut free, Gluten free facility. Arbonne Protein Powder has 20g of plant based protein from pea, brown rice and cranberry. It also provides essential amino acids & more than 20 essential vitamins and minerals. Brown rice syrup is not quite as sweet as honey but better for those needing to decrease their sugar intake. 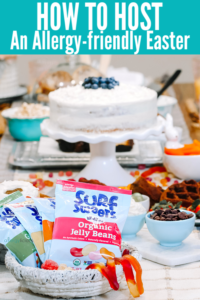 As far as sweeteners go, it is vegan, kosher, gluten free, all-natural, nearly always organic, and one of the healthiest sugar substitutes other than stevia. Plus it is a great allergen-free option. What’s your favorite snack for on the go? Is it a homemade bar? A piece of fruit or veggies? What do you wish you could find at your local store that would make life a little easier to ward off the munchies? This post was revised from 2013. New photos were added and the recipe was adjusted to reflect a change from using honey to brown rice syrup. Oh my gosh, this looks so good! I think my kid would love these. Yes, they do look tasty!! Sounds like the perfect afternoon pick me up…or breakfast on the go! I love how easy these are to make. They’re so much better than store-bought! It’s crazy how easy it can be to make your own bars. We all go for convenience, but making your own is better for time (in the long run) and $$$. And you are right, they also taste so much better too. These look so good! You might have upset my husband though as I am off to steal some of his precious protein powder! These look SO good! I love crispy rice in my sweets. The texture is just so good! You are right, crispy rice just adds that nice bit of crunch and texture. Now these would go over REALLY well in my house! May have to give them a go since I have all of these ingredients on hand. These and the SunButter Cups and you will be all set! Soooooo delicious! I am tempted to make this myself! Ceara, I think you’ll love the little crunchy rice in it too.